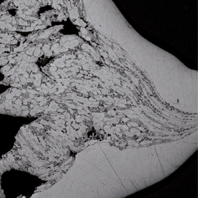 Normally, questions of connecting technique are always very complicated with sandwich struc- tures. Not with AFS! 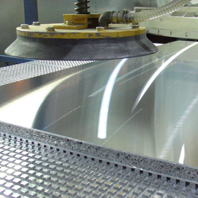 Due to its metallic charac- ter, it can be connected like normal aluminium which makes it much more cost-effective. 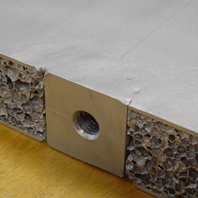 AFS is a sandwich material which can be integrated into a welded construction. Aluminium foam sandwich AFS sheets can be processed like normal aluminium sheets before foaming; the main difference is the three-layer construction consisting of aluminium cover layer / unfoamed aluminium core / aluminium cover layer. 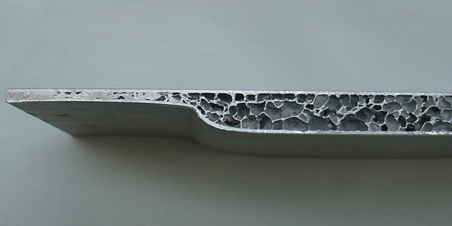 This basic sheet can be formed before foaming, is foamed in a forming tool and pressed to its final dimension while still warm in the forming tool. 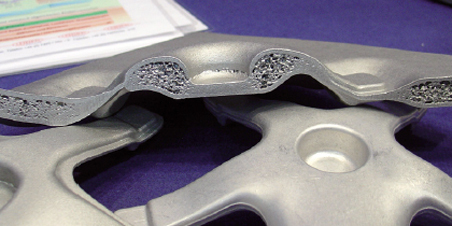 Since AFS can be easily formed while still warm, it is also possible to manufacture complex forged elements without damaging the core or the core/cover layer connection. Furthermore, you can manufacture 3-dimensional formed parts from flat AFS sandwich panels. For this, however, you need the corresponding tools. AFS can be easily cut to the required dimensions by circular and band saws. However, please note that the choice of the correct lubricant is important. 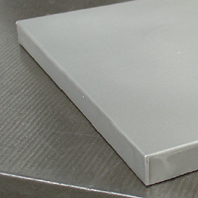 Aluminium foam sandwich sheets can easily be processed mechanically. 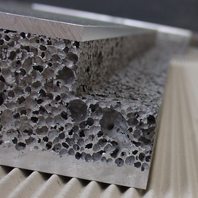 Here, milling of the core and the transition aluminium foam / cover layer are considered uncritically in contrast to all other types of sandwich panels. For high-precision and visually attractive surfaces, the cover layers should be made from EN AW 5754. 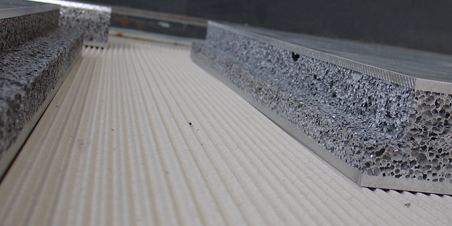 Edge areas are a problem with sandwich materials since the edges are visible and at the same time, the intrusion of liquid and dirt must be avoided. 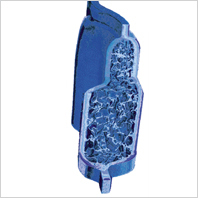 Furthermore, the edge areas are often subject to mechanical stresses. Apart from conventional edge sealing methods like sealing with glue and sealing compounds, adhesive tapes etc, AFS provides the alternative of sealing the edge by milling off a cover layer and the core and subsequently flattening down the remaining cover layer. AFS is the only sandwich material which can be grouted at the edges without damaging the structure. Furthermore, the edges may be welded. 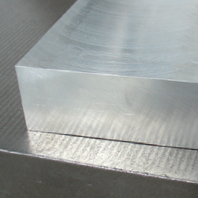 Methods for welding of AFS aluminium foam sandwich sheets are TIG / MIG / laser welding. 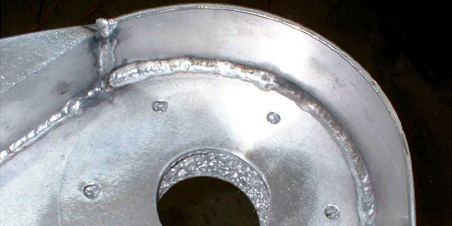 The general guidelines for welding of aluminium materials must be observed. 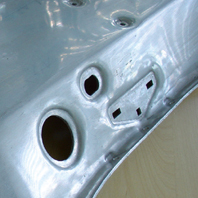 Only the cover layers are welded while the core remains untouched and serves as a kind of welding fixture. Due to this, deformation of the components is considerably reduced. The connection core / cover layers remains completely intact. As an example for a welded aluminium foam sandwich construction, see the detail of a lifter arm support of a telescopic crane. Here, extruded profiles or sheets can be directly welded to the cover layer of the sandwich element. As additional welding material, AlMg4.5Mn was used. It is also possible to weld the edge areas of the sandwich element to make it gas-tight. With a clever choice of the layout at the edge area, you can get the impression of a solid sawed aluminium sheet. Another interesting option is welding in or on of connection elements.